Nowadays, social network has become a powerful information source. At the advent of new services like WeChat Official Account, long-text contents have been embedded into social network. Compared with tweet-style contents, long-text contents are better-organized and less prone to noise. However, existing methods for real-time topic detection leveraging long-textual data do not produce satisfactory performance on sensitivity and scalability, and long-text based trend prediction methods are also facing absence of stronger rationales. 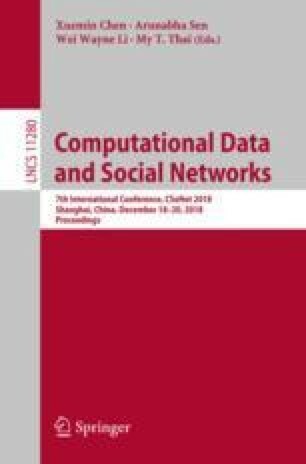 In this paper, we propose a framework specifically adapted for long-text based topic analysis, covering both topic detection and popularity prediction. For topic detection, we design a novel real-time topic model dubbed as a Cost-Effective And Scalable Embedding model (CEASE) based on improved GloVe Models and keyword frequency clustering algorithm. We then propose strategies for topic tracking and renewal by taking topic abortion, mergence and neologies into account. For popularity prediction, we propose Feature-Combined Bass model with Association Analysis (FCA-Bass) with a strong rationale transplanted from economic fields. Our methods are validated by experiments on real-world dataset from WeChat and are proved to outperform several currently existing mainstream methods. This work is supported by the National Key R&D Program of China (2018YFB1004703), the National Natural Science Foundation of China (61872238, 61672348, 61672353), the Shanghai Science and Technology Fund (17510740200), the CCF-Tencent Open Research Fund (RAGR20170114), and Huawei Innovation Research Program (HO2018085286), and the National Key Research of China (2018YFB1003800). Quanquan Chu finished the experiments in this paper when he was an intern at Tencent Shenzhen. The authors also would like to thank Chunxia Jia, Yiming Zhang, Chao Wang, and Tianxiang Gao for their contributions on this paper.